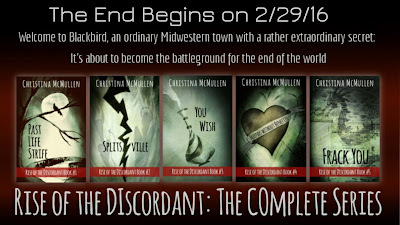 On Monday, February 29th, the Rise of the Discordant series is coming to an end. What had initially been an open ended project became an ambitious seven book series, but ultimately, I brought it down to five. Why? Well, to be honest, I had a nice, natural end to this story arc and decided not to fight it. Besides, I may return to this series one day. If nothing else, I'm interested in following certain characters on their continuing adventures. Perhaps fate may even take some of them out of Blackbird at some point. But for now, we have to say goodbye to the gang. This is now my second complete series. It's quite a bit different from my first, but I'm no less emotional, which surprised me. I mean, this is my twelfth book and this series has been humorous. Surely by now I've grown accustomed to hitting publish and being on my way. No, not at all. It still hits me just as hard. That's right, it's Valentine's day weekend, a polarizing corporate holiday that brings out the best and worst in people. For me, it's a good excuse to show off, remind you that I'm still giving away free stuff, and let you fine folks know how much love and appreciation I have for you!